I have written quite a lot about the basic 1920's so called '1 hour' dress pattern, and that is because it's super easy to make both the pattern and the dress itself! I have several of them now, and as a curvier gal I like to spread the gospel that 1920's styles are for everyone, not just the thin boyish figures of 1920's fashion plates. 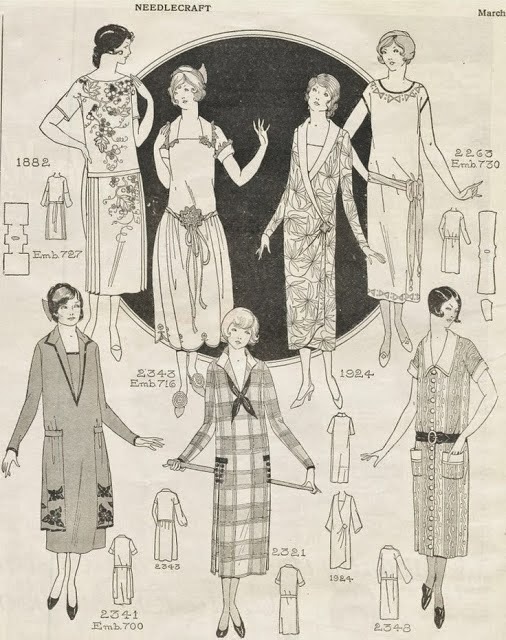 It can be next to impossible to find original 1920's garments, let alone affordable wearable ones (they would be nearly 100 years old these days! 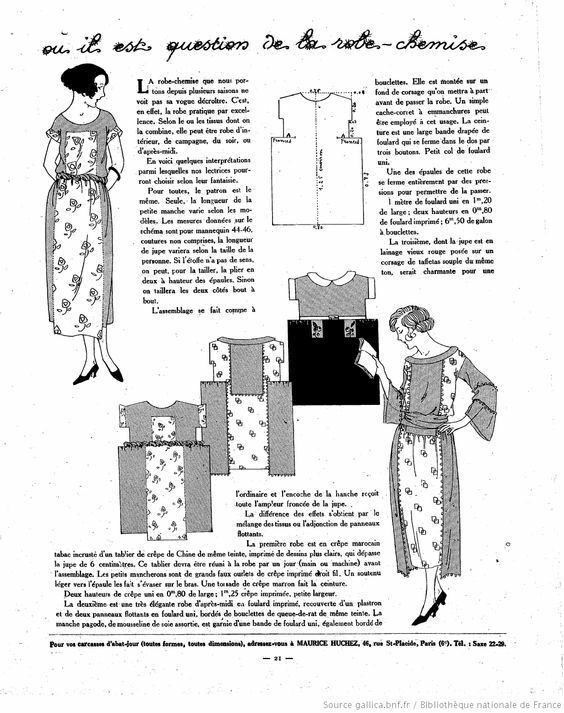 ), so DIY is the best option for 1920's fashions. The 1 hour dress also happens to work quite well as a "modern" dress now in 2016. I thought as I had some fabric waiting to become another one of these dresses I'd document the process in a short series of posts so you all can see how truly easy it is to put one of these dresses together! This "Cottage Frock" is only one piece! But that piece is basically the 1 hour dress pattern with the shoulder seam eliminated but cutting it in one. They add pockets to the front of this dress too, and the sleeves, neckline, and pockets look like they are finished with bias tape. Most of the styles above can be made with the basic 1 hour dress pattern with a few modifications. One has buttons down the entire center front, easy enough to separate the front piece and add a button placket. Another has a fuller gathered skirt, simple just separate the "bodice" and skirt portions of the 1 hour dress and make the skirt wider, gather it to the bodice to get this look. This time the instructions are in French, but the pattern is still very similar! I have explained this pattern once before here on the blog in this post, but I wanted to have another crack at it for (hopefully) more clarity. Here is a quick sketch of the finished dress on the left and the pattern I use to make it on the right. Now lets label that pattern so we can chat about how to draft one for yourself. The most important measurements are going to be your bust measurement and your desired length of the total dress, so have those at the ready. Measurement A above is the main width of the dress and is your bust measurement. 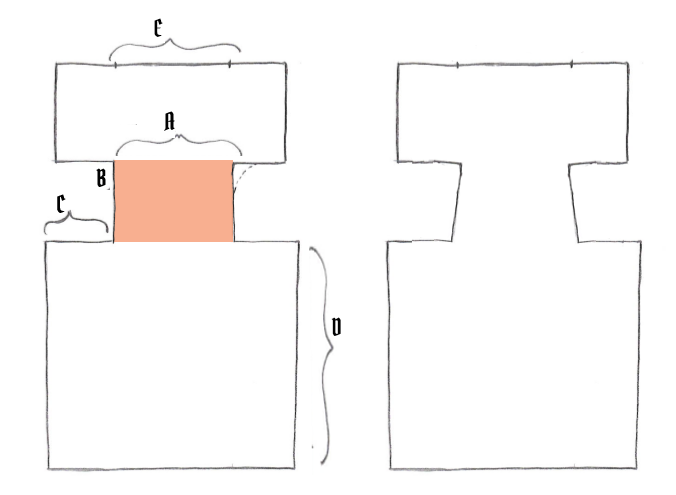 If you were to draw a rectangle with measurement A (bust) as the width and the length of your total dress (from the top of your shoulder to the desired hem length) as the length of the rectangle, that would be the very simple start to drafting this pattern! (fig. 1 below). The skirt extensions start wherever you want your classic 20's drop waist to start, measure from your shoulder to where you want the drop waist (mine is 22" down from the shoulder). Since my hip measurement is 44" I added 8" total (4" each side) to my pattern for plenty of room in the skirt to move. This fullness gets pleated or gathered to the waist for that sleek 20's column look. 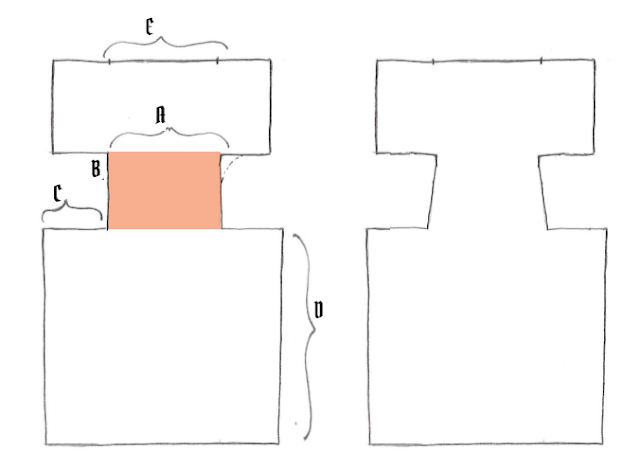 If your hip measurement is significantly larger than your bust measurement you may want to account for this by modifying the side seams like in the drawing on the right above but it is not usually necessary. The sleeves are created by measuring 10" down from the top (you can do less, you can do more, this is a really versatile pattern but 10" is a good place to start). I added a very slight sleeve of only 3" each side. These are the exact measurements of the floral dress at the very start of this post by the way :) Of course you also need to add seam allowance to this finished pattern! I add a half inch seam allowance all the way around, but use what you work with most often or need based on how you like to finish your inside seams. I'll be using this same pattern for the next dress I make, and I'll take photos of how I make it along the way. 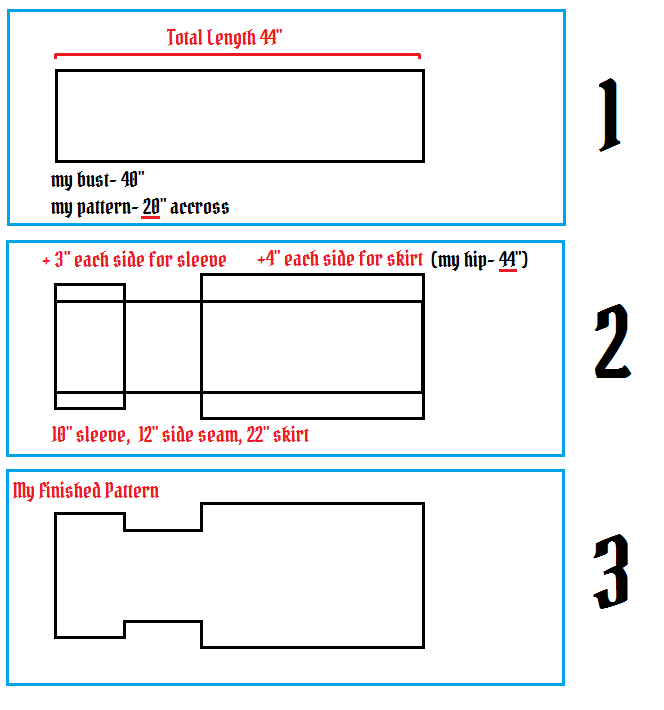 My hope is that a few of you who are beginner seamstresses or just scared of drafting your own dress patterns may give the 1 hour dress a try! Thank you very much for this! I've been looking forward to making a one-hour dress since I first saw it on your blog, and this is just further inspiration! Sadly I've got a lot of other sewing projects in the way for the next few months, but I'll be sure to have a go at this with some teal dotted chiffon I picked up in Jo-Ann's, once I find the time. Summery 20s-30s dresses are calling my name! I'm glad to help! I have a long list of sewing projects too, the 1 hour dress can be a nice breather easy project for in between crazy intricate projects as a sort of rest. Thank you so much for asking about my book, it's going well and I am just doing one final edit before I start sending it to literary agents ahhhhh! I made one of these recently! It went together super quickly. I love it. I have also used the commercial pattern archive (http://copa.apps.uri.edu) to look at the pattern pieces for original patterns. (I use the sample search function). If you have a basic idea as how your 1920s dress goes together, it's easy enough to make it large enough to fit your hips. :-) I've made 2 dresses that way. 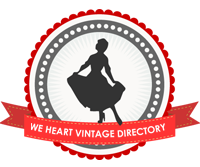 What an awesome archive, I could get lost on there for hours! Happy to be of any help! I definitely would recommend a mock-up so it sounds like you are on the right track already! Thoroughly helpful, informative and downright interesting post. It's fascinating, isn't it, to observe how "fast fashion", in a somewhat different context from today's meaning of such, was really starting to emerge in the 20s, whereas even just a couple decades ago, the idea of a super quick-to-make garment would not have flown near as well in most sartorial circles. True indeed. It's strange how much more often average women sewed for themselves in the past too, unlike now when nearly no one still does! Thanks for breaking the process down like this, it is going to be so helpful. I am adding it to my try to make list! If my bust and my hips are the same diameter, would this then be a rectangle with a bit at the top for the sleeves? Also, in the French one on the bottom, do you have any recommendations for doing the sleeves? I really love the look of that dress! Yes essentially, though I would add some width to the skirt portion too so you get the same pleats/gathering to allow you a bit more room to move. Then again you can cut it as a straight column, but I might add a slit in the back then? For those sleeves it looks like they are set a bit off the shoulder and I'm not exactly sure how they are done! Irritating that they didn't include an illustration for that sleeve. Perhaps try a bell sleeve shape and then cut it into tiers. Hello there! I'm Bianca and here on The Closet Historian I study and recreate vintage fashions- sketching, pattern drafting, sewing, and thrifting my way to a vintage inspired wardrobe. I also occasionally attempt knitting, travel as often as I can, and make videos for YouTube, all while writing novels on the side. BALENCIAGA’s Instagram – Genius, or Shortsighted? (c) 2012 Copyright Bianca Esposito, All rights reserved. Simple theme. Powered by Blogger.